We’ve identified the apps that are actually used by the 969.49m strong global smartphone population. So here is GlobalWebIndex’s top 10 of actively used smartphone apps, based on the % of global smartphone users who have taken advantage of the services they offer in the last month. It’s no surprise to see that Google Maps is No. 1 Used by 54% of the global smartphone population in the last month, it’s the go-to solution for lost and confused consumers. Apple Maps is nowhere to be seen but Nokia’s Ovi Maps is used by 9% of smartphone users and ranks No. 11 in our chart. In the No. 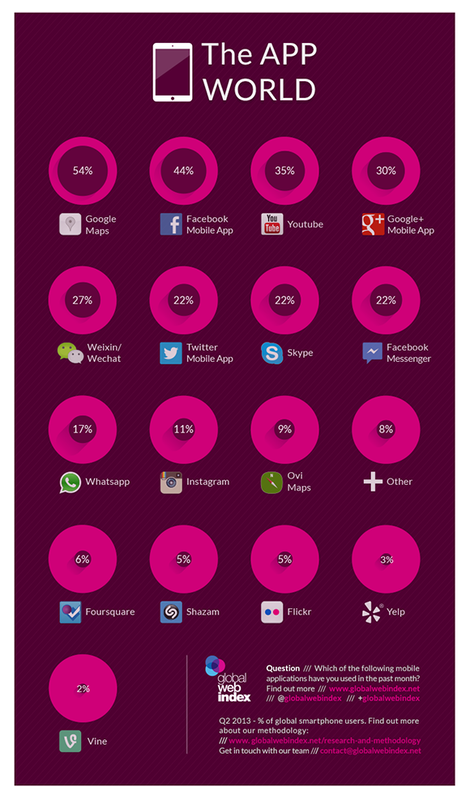 2 spot in Facebook’s Mobile App, used by 44% of global smartphone users to keep in touch with friends, family and brands. Facebook also has two other players in the top 10 – of which more later – but Google as well as taking No. 1, also takes No 3 with YouTube (35%) and No. 4 with the G+ Mobile App (30%). Weixin / WeChat makes it to No. 5 and our research reveals that the Chinese-based service is being actively used by the 27% of the global smartphone population. It’s an impressive performance considering that is basically used only in China, Hong Kong and Malaysia. In at No. 6 is Twitter’s Mobile App with a 22% active usage number, closely followed by Skype and Facebook Messenger, which both score the same active usage number. Online messaging service WhatsApp has now serves the 17% of the global smartphone population and takes the No. 9 spot. Despite massive publicity it attracts, however, it’s worth noting that Weixin/ WeChat and Facebook Messenger, which both provide a similar service are more widely used on a global basis. Finally at No. 10 is Facebook-owned vintage picture app Instagram, which has been actively used by the 11% of the global online population in the last month, but growth since Q1 2013 has been rather stagnant. I was expecting to see Vine ranking higher than No. 17 but globally only 2% of respondents admit to have used it in the last month. Whilst its growth is quite encouraging, Vine still has long to go to catch up with Instagram and is also behind Foursquare, Shazam, Flickr and Yelp.